The band, BLACK MESSIAH, has earned quite an impressive number of accolades in their twenty-five years of service to the altar of heavy music. Originating from Germany and beginning their journey in 1992 as a purely Black Metal outfit, the band has evolved into a more Pagan/Viking Metal sound, and over the years, have graced the stages of major European festivals like Waken Open Air and Summer Breeze; BLACK MESSIAH have released a total of six albums before this current offering titled ‘Walls of Vanaheim’ released through Trollzorn Records. This album is my very first introduction to this band and it was a unique and refreshing experience as Pagan Metal is a subgenre I am quite unaccustomed to. 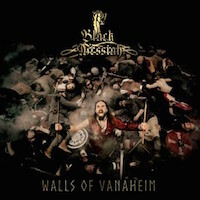 “Walls of Vanaheim” is more than an album, it’s a story. The opening prologue is a spoken word piece that sets the scene of Viking mythology that guides its direction; this is directly followed track “Mimir’s Head”. I am somewhat neutral about this song I must admit: the musicianship is excellent here, don’t get me wrong; every member is clearly at the elite level of their craft and the production is more than a worthy release. But there was really nothing “catchy” about it. It pains me to say this, but the mediocre beginnings of this album took a while to improve. It wasn’t till midway through this album that BLACK MESSIAH hit that all important note that really hooks in the listener. The track “Satisfaction and Revenge” however is a true masterpiece of metal, guitars and drums are in perfect partnership, the violin touches add great flavor, and the vocals are nothing short of magnificent. Deep chesty growls build to a powerful chorus that would make top tier Power Metal vocalists envious. But I can’t help but feel that this story theme that they have added to the album is its biggest failing. After every song there is a spoken word track explaining the next “chapter” in the story; it only seemed to slow the albums progress and my enthusiasm to hear more. Overall, I think the concept that BLACK MESSIAH went for here, had a lot of merit and clearly shows some original thinking, but failed to hit the mark. There is clearly immense talent with the members of this band, but bands write albums, not screen plays. This story album really pigeonholed them into writing the next chapter and made the whole thing drag a little.